What an amazing journey! 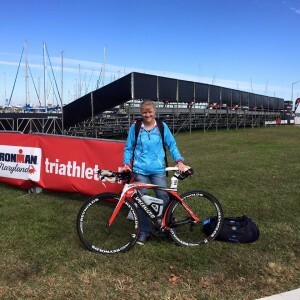 After training all year to participate in the Ironman event in Maryland, I was devastated to find out that it was being cancelled due to Hurricane Joaquin. But I was absolutely thrilled when they rescheduled for two weeks later (unheard of and never done before by WTC – we were making history here!). It was still possible for me to attend so I made all travel arrangements to go. I was super excited to have the opportunity to meet my goals. On race morning, the weather was cold (46 degrees and windy! With the wind-chill factor it felt like 36°). Because of the high winds they decided to postpone the swim another 30 minutes and shorten it to 1.2 miles (half the normal distance) to allow the wind to die down. The new start time was scheduled for 7:30 A.M. The news was a bit of a downer as we had already been nervously anticipating the start with our goggles and caps in hand in the frigid temperatures seeking shelter behind the gear bag trucks etc…this would mean we would have to wait another half hour! There was a lot of nervous energy in the crowd but overall we supported the decision as safety is top priority. After a while the wind died down so they decided to increase the swim to make it 3000 meters and change to a double loop triangle instead of a rectangle route. Not too much later a young voice sang the national anthem and the horn sounded to start the first swimmers. We were all excited to start our journey. Even with the rolling start the swim was crowded and stayed crowded the entire swim which made me nervous as I’ve been hit hard on the swim before so I slowed and just tried to avoid people. It was still really choppy with big waves and I swallowed a lot of salt water. 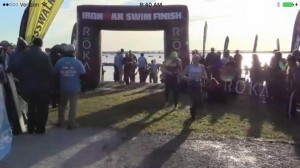 Overall the swim was really slow for me but I was happy to exit the water safe and be on solid ground again. The air temperature was noticeably colder than the water and I know the wind would make it even colder so I decided to take the extra time to put my knee warmers, arm warmers, beanie and gloves on in transition. I am glad I did! It was cold and very windy on the ride. I wrecked early on at one of the aid stations as I tried to open a water bottle with my teeth. It still had the seal on it when they handed it to me. Normally they have them open for us but this one wasn’t. As I was filling my Speedfill bottle with one hand and the other on the breaks, another rider slowed in front of me causing me to break one handed and I lost control and t-boned a tire on a bicycle that was attached to the back of a parked vehicle; clearly a fellow triathlete volunteer’s (sorry about that!) It saved my bacon. I had to put my chain on and adjust my gears, and it shock me up a bit. My gloves and arm warmers kept me from losing too much skin. My hand and arm was a bit swollen and hurt some, but other wise not too bad. It could have been much worse! I hopped on my bike and went on my way hoping I didn’t screw anything up too bad. Everything seemed okay so I tried to shake it off and get back in a good groove. I seem to pass a lot of people on the bike and tried to push myself even though it was very windy. It seems that I made up some ground from my poor swim; the problem was I was feeling the effects of swallowing too much salt water so I had a hard time stomaching all my planned nutrition and was coping with waves of nausea. About mile 40 the wind really started to pick up and it didn’t seem to let up no mater the direct we turned. It was relentless! It kept on blowing and blowing. The last 20 miles or so were brutal gusty winds and cold! I am fairly light weight so it was really blowing me around and made me nervous so I slowed. Periodically there was some traffic which still makes me really nervous as I am still getting over riding anxieties from being hit by the truck. I figure it was better for me to be safe and not have another wipe out. So much for making up a lot of time. I was happy to get off the bike with no flat tire issues as I saw many on the road fixing flats. I am so glad I wasn’t one of them. I am not sure my hands would have worked to do it in the cold! As I entered transition I knew it would take me a while to get through it. Normally they have volunteers you hand your bike to and they rack it for you but because of the reschedule they were low on volunteers so we had to rack our bikes ourselves which takes more time adding to an already long day. 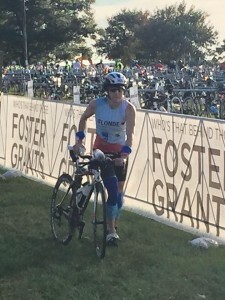 My bike was situated so I had to run the whole length of transition twice with my bike but I trucked through as I was excited to get to the run (my favorite!). The run started off into a significant headwind but overall I felt pretty good and my legs were responding well. I was happy to be running. I tried to keep a steady effort despite the windy and cold conditions. 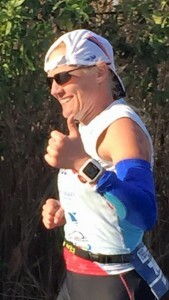 I was happy to have my arm warmers on and wore my hat backwards to keep some heat in and offer some sun protection without losing it in the wind. I have light blonde hair so my head and skin burns easily (the don’t call me “blonde runner” for nothing – lol). I am happy to report I did not have any sunburn. Yea for sunscreen and protective clothes! The first 10 or 11 miles of the run I felt pretty good overall but could start feeling my left knee, the one I had surgery on from the accident. I was hoping to make it to the half marathon before it bothered me as I have been having problems with it and my left hip in training. I knew this was a possibility and mentally plan to just maintain good form and keep moving forward. My pace did slow but I was able to meet my goal running my first half marathon in close to two hours. I slowed quite a bit on the second half of the marathon due to knee pain. The wind and cold contributed but I think my lack of nutrition on the bike was starting to catch up with me and that salt water intake on the swim ultimately cost me some run time. Despite everything I kept moving forward and tried to soak in the experience. 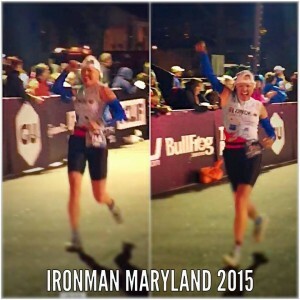 I was doing a Ironman in Maryland! I was so glad they didn’t cancel again even with the severe wind and cold! I knew I would complete my goal today. I was going to be an Ironman! My spirits were up. The last half hour of the run it was starting to get dark so it was a bit hard to see and part of the route was in town which was really cool with lots of spectators cheering but the brick road was uneven so I tried to be careful with my footing and had to slow. I certainly didn’t want to trip and if you’ve ever seen me run you know I don’t run with a lot of spare clearance over the ground. I tried to pick up those tired legs more. 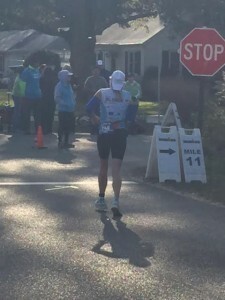 I was happy to make that final turn and be running towards the finish. What an amazing feeling to run down that finish chute and accomplish a goal that I set out to do so many years ago! I was thrilled to hear Mike Reilly announce my name over the loud speaker! 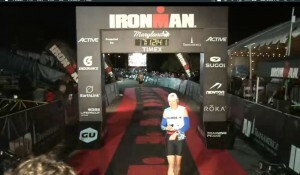 I was a freaking Ironman! I did it! My time was 11:40:27, 13 place in my division and 65 OA female, 374 OV finisher. Not too shabby for a first and not being 100% going into it. I know a lot of people were pulled off course due to hypothermia etc, but I am glad I made it through. I really appreciate all my family, friends and sponsors support. You make this all possible for me, I can’t thank you enough! I also wanted to give a special shout out to the volunteers and my husband that came to support me and weathered those tough conditions with us! Thank you! If you are curious if I would like to do another one, the answer would be YES! Immediately after finishing I wanted to do another one; just ask my hubby, he was there! (Thanks for all the pictures babe)! I guess you can say I am hooked!